I determined TDC by the "see when the piston stops moving"; normally I'd do this with a piece of wire through the spark-plug hole, but since I was laying underneath the truck, turning the engine over by the flywheel, I used my little inspection camera through the spark-plug hole and watched for the piston stopping... splitting the difference between rising and descending. Good try but that'll be where your 10 - 15 degrees has gone. 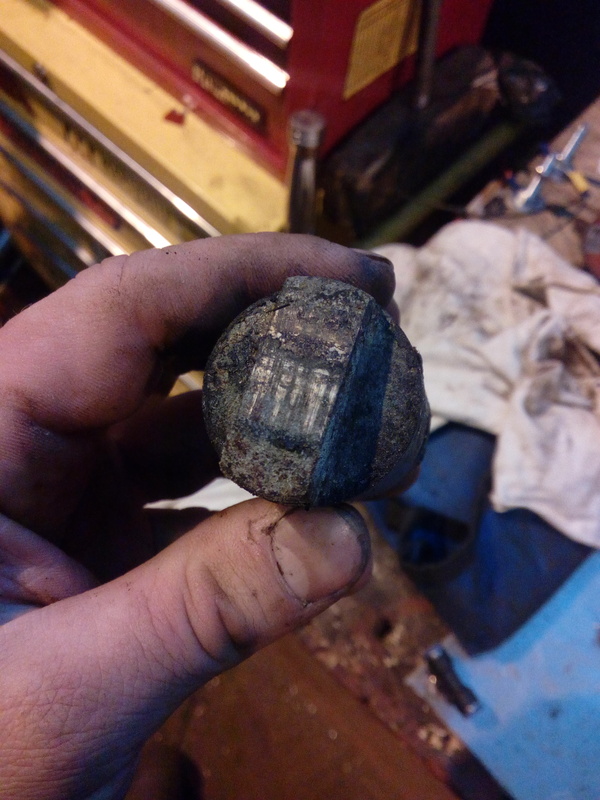 The piston travel is so small close to dead centre that you can't reliably determine exact dead centre by eye. 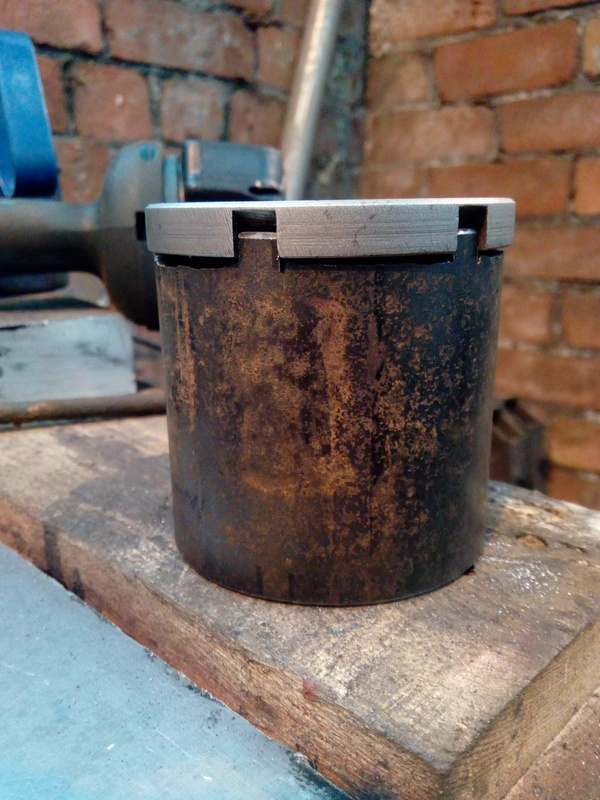 The normal way of doing it, if you have to, is to mark piston position either side of dead centre at a point much further down the stroke (where the piston travel is much larger for each degree of crank rotation) and then split the difference. 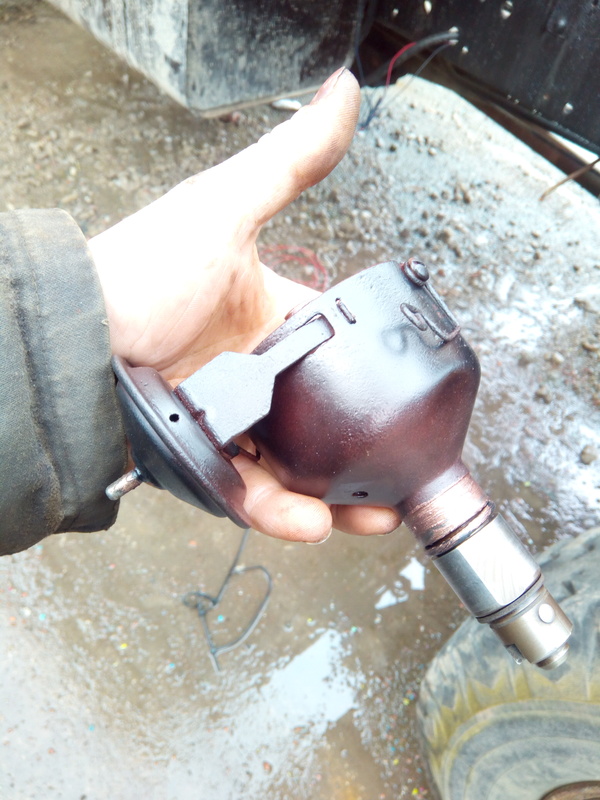 Even then, it's difficult to do by eye, particularly through the spark plug hole, and I'd normally expect with this method to use a dial gauge to determine piston position for accuracy. A thought had crossed my mind, actually... the timing pointer on the underside of the engine, was it offset to one side slightly -- i.e. not exactly 180° to the timing window at the top? Could it be an older engine, refurbished, and with the flywheel turned 180° to make the timing mark line up with the window in the clutch housing; or am I dreaming up nonsense? I don't know about nonsense but I think you are overthinking it. 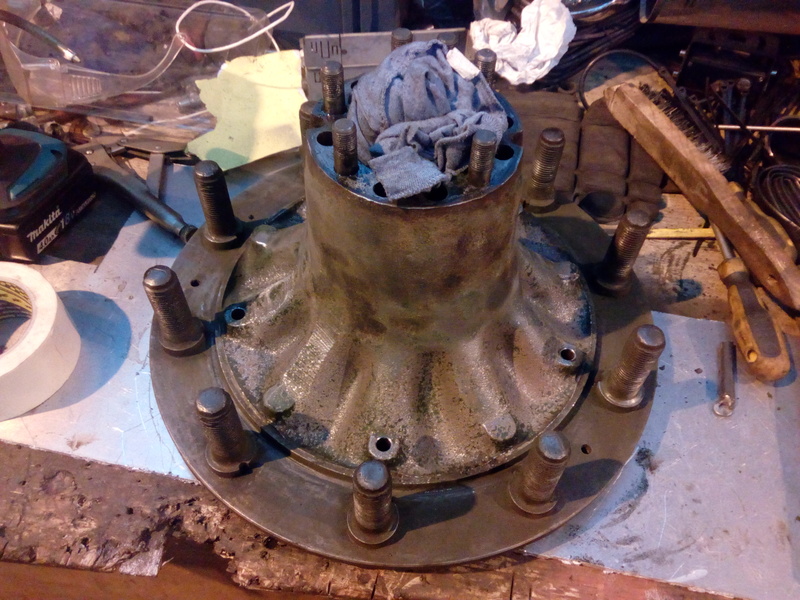 Unless you can demonstrate that the wrong parts are on the engine I would assume that the timing marks on the flywheel and casing are correct to start with, get the right condenser, get the points set up and time to the marks, then see how it's behaving at that. To narrow it down, I tried just fitting the clamp alone; and that was getting smacked about by the points cam. I don't think I have the condenser that was on the truck when I got it, any more, but off the top of my head it had a smaller diameter. Oh, OK. Sounds like the wrong condenser supplied. Didn't someone say upthread that most fuel problems are ignition problems, or was it the other way round? "Most carburettor problems are actually ignition problems." is the advice I heard. 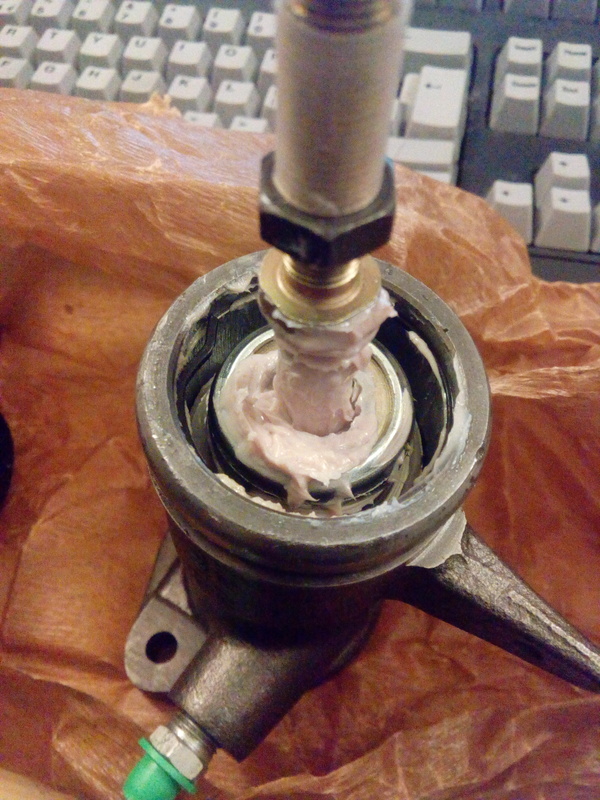 I suspect it doesn't matter how perfect your ignition is, if the float bowl is empty, though... On that note, I undid the fuel hose to the carb and made sure it wasn't kinked or pinched, and checked that I am getting fuel flow (Fuel is flowing, but not as much as it should be. Will look into this next chance I get; may be that the pick-up tube is only just reaching the fuel in the bottom of the tank. It'll probably be Thursday before I get to stop still long enough to tinker with it, as usual. :nut: I'll start by putting fuel in the tank, and work my way up from there; if it's still playing ball, then I'll have another go at checking the timing. 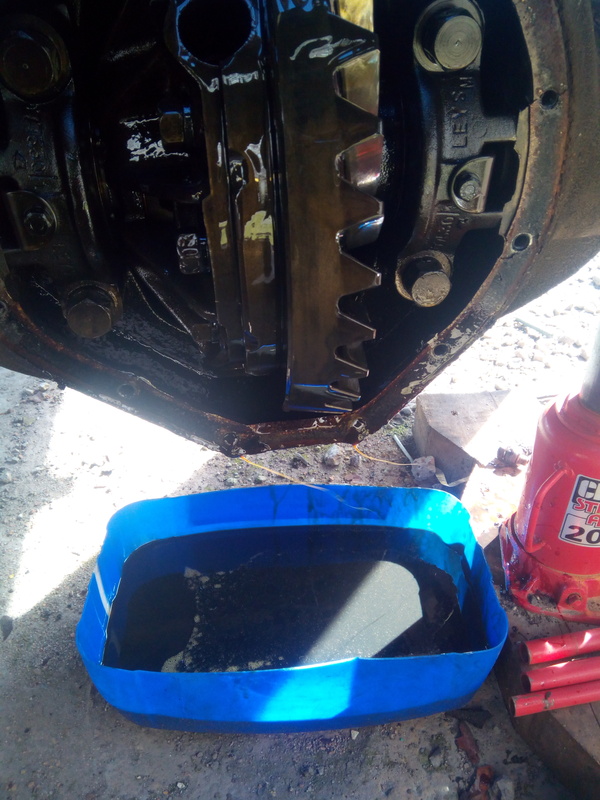 Hoik the hub off, haul it inside, and prep to fit the new axle seal. 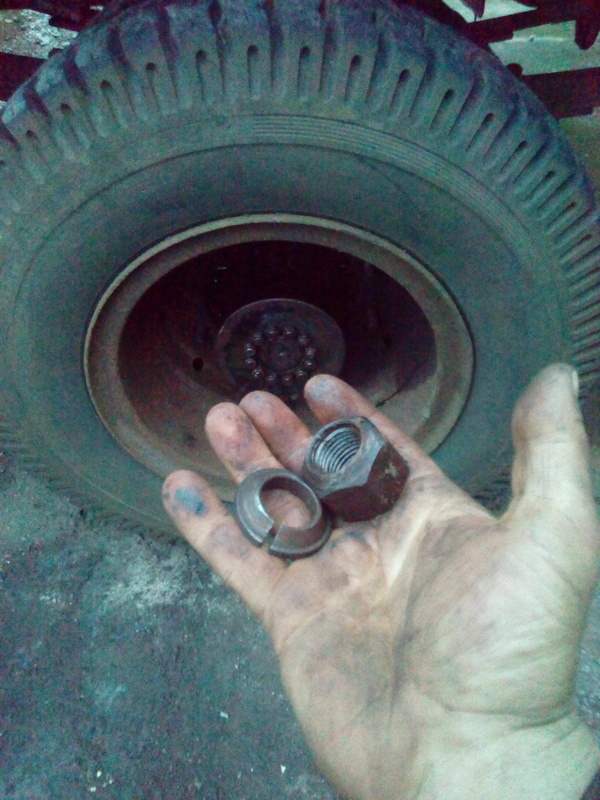 Then, because it was clearly going too well, it turns out the seals are the wrong size for the axle. They fit lovely in the hub, though. It's a bit hard to see, but there's a fair sized gap between the seal and the surface the seal should run on. EDIT: Correction, they were 100-130.18-14. 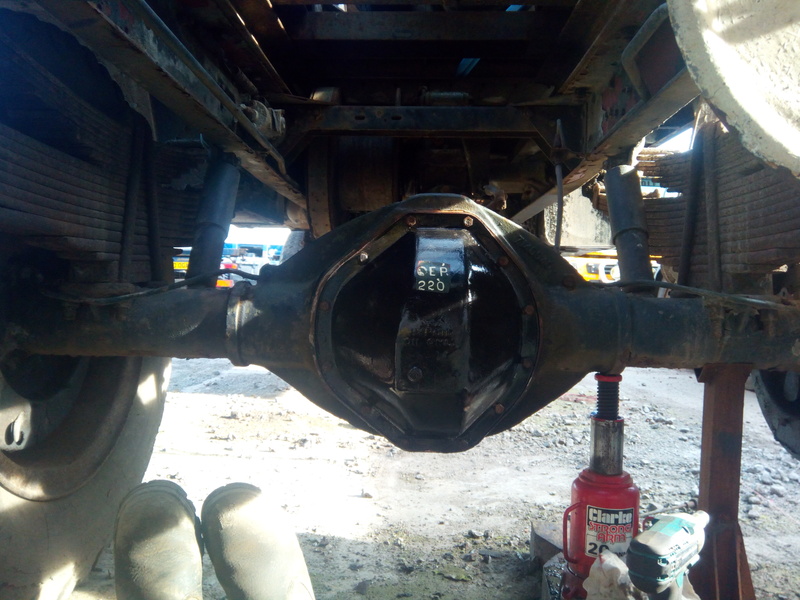 I've since got some others to the measurements I'd taken of the axle that should be significantly closer than that. 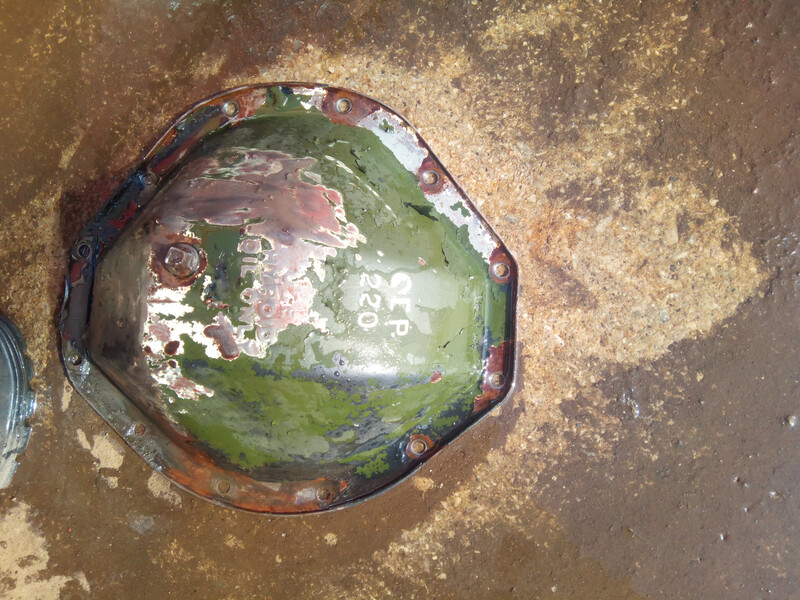 With the wind taken out of my sails, I just settled on cleaning & painting the hub. 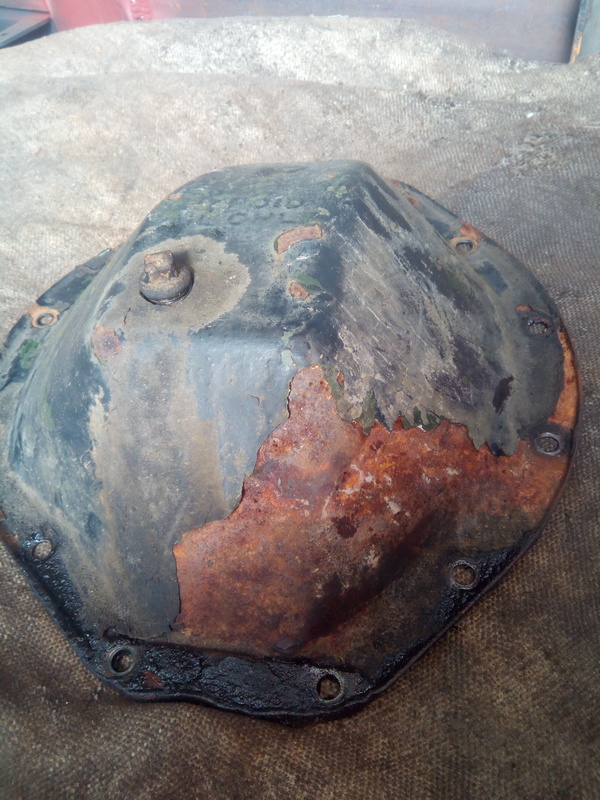 Did my best degreasing it, but there's still some oil absorbed into the metal, I think. First coat of red primer; which is when I start seeing the spots where the white spirit didn't get rid of all the soaked in oil. It did mostly take, though. Now, belatedly, back to a week or two ago, ish... I did a rough check of the static timing by barring the engine over to the embedded timing mark, and looking to see what the points were doing. The timing is definitely a good way from the stock late-1950s timing, for sure; more advanced than the 5° in the manual. A little poking and prodding around online leads me to believe that it's advanced further than stock spec in order to counter the slower burning of modern unleaded fuel, relative to the fuel available when the manual was written, so as not to damage exhaust valves or cause overheating. More updates on that subject to come. Oh, and I now have a deadline, it seems. 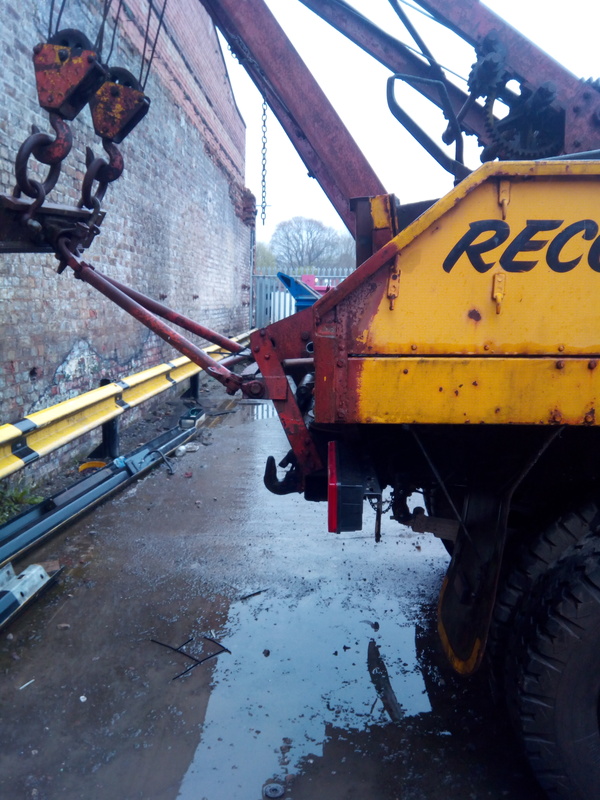 Apparently, work only have two years left on the lease for the workshop, and then the bulldozers start moving in. :shocked: Better get myself in gear, then! 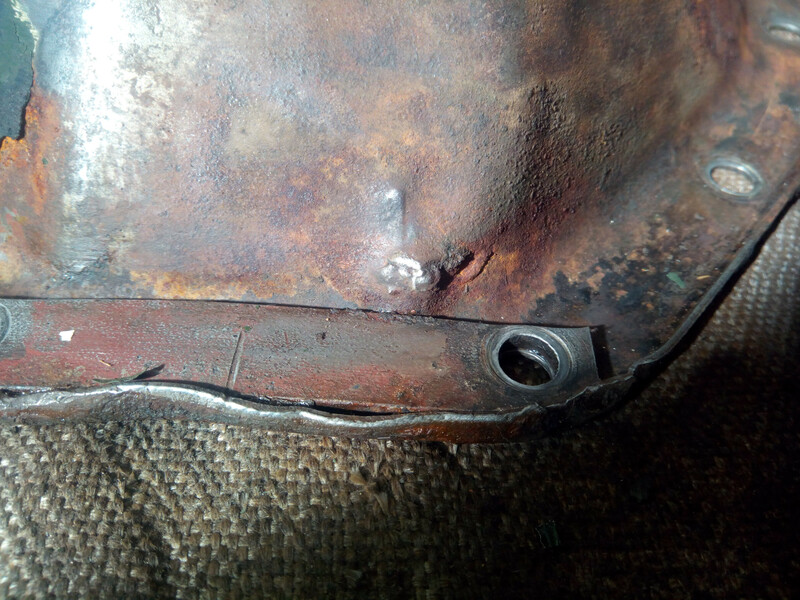 I've managed to get the brake cylinder and the bisector off that corner; once I managed to get the mounting nuts -- and the little stop pin -- loose, it came apart with surprising ease. 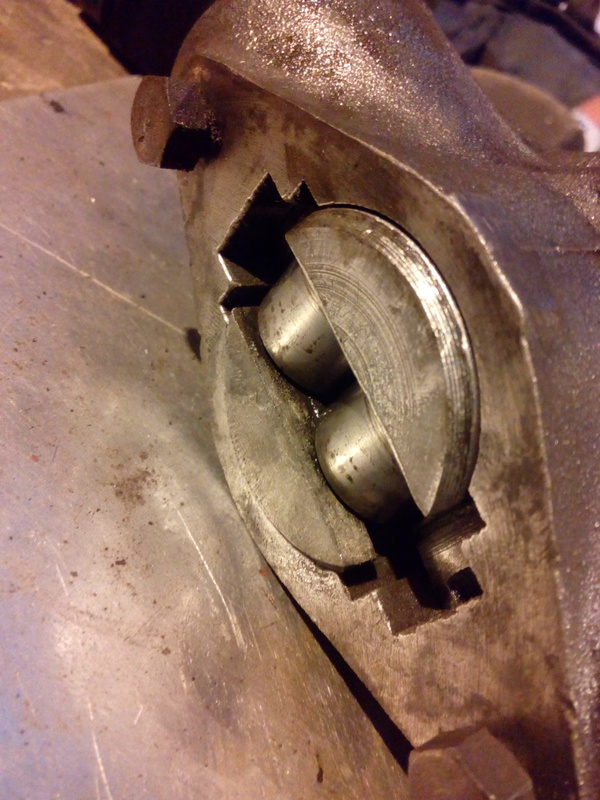 I'll probably order some new nuts for the mounting studs, since the originals are a little corroded and rounded; it was bad enough that I had to hammer the 1/2" spanner down on them very firmly in order to get it to bite. 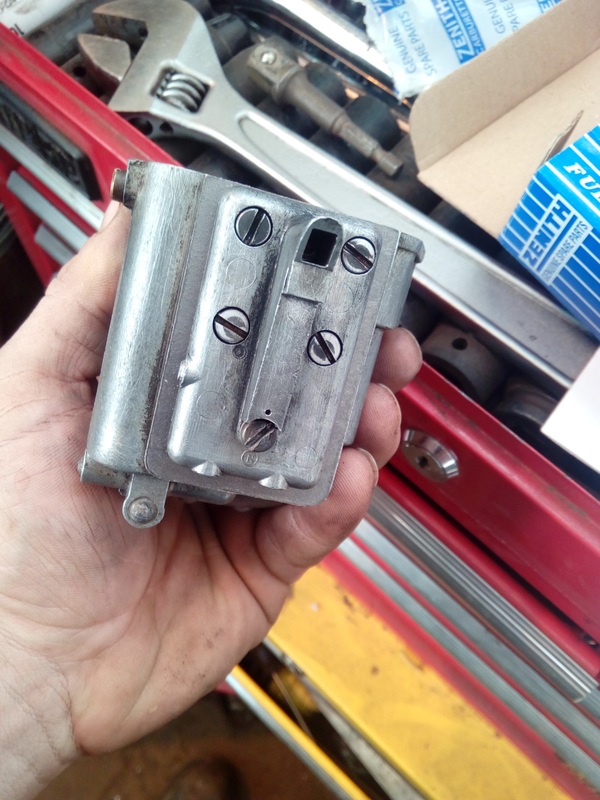 I'd like to do the same with the stop pin, because that was more of the same but worse; I hammered an 8mm socket down onto that which got me enough bite to break it free, then it screwed out without a fuss. 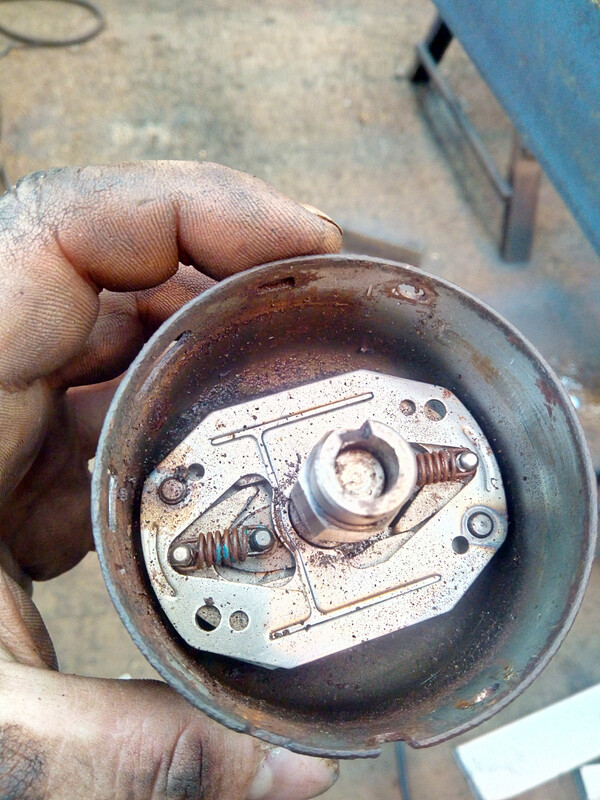 After the stop pin was free, and stored in a safe place (to never be seen again ), I did the needful pushing and twisting to unscrew the internal spherical nut that holds the pull-rod into the cylinder. It unscrewed so easily that I honestly thought I'd broken something, until it all sprung apart in a stereotypically comical fashion. Bisector. To be carefully dismantled, inspected, detected, defected... *ahem* cleaned, freed up, lubricated, and reassembled. 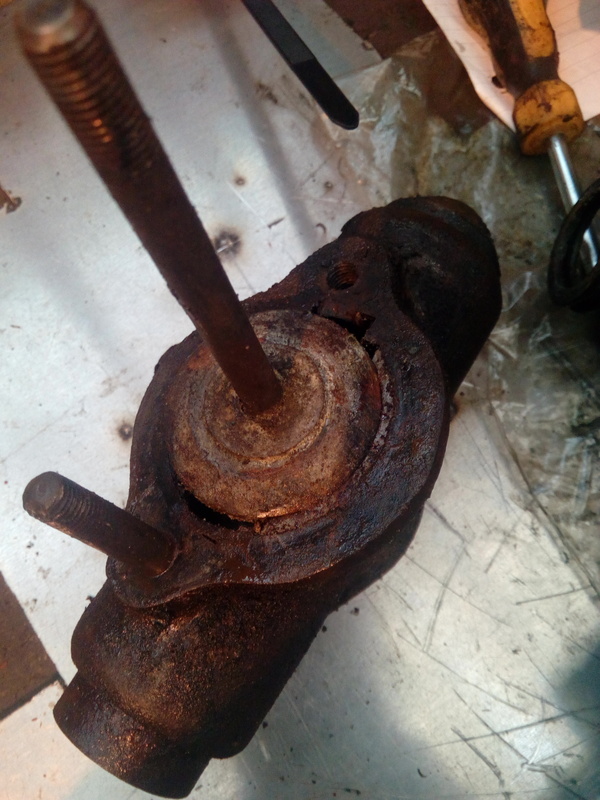 Brake cylinder and handbrake pull-rod. To be carefully dismantled, cleaned up, cried over, etc. 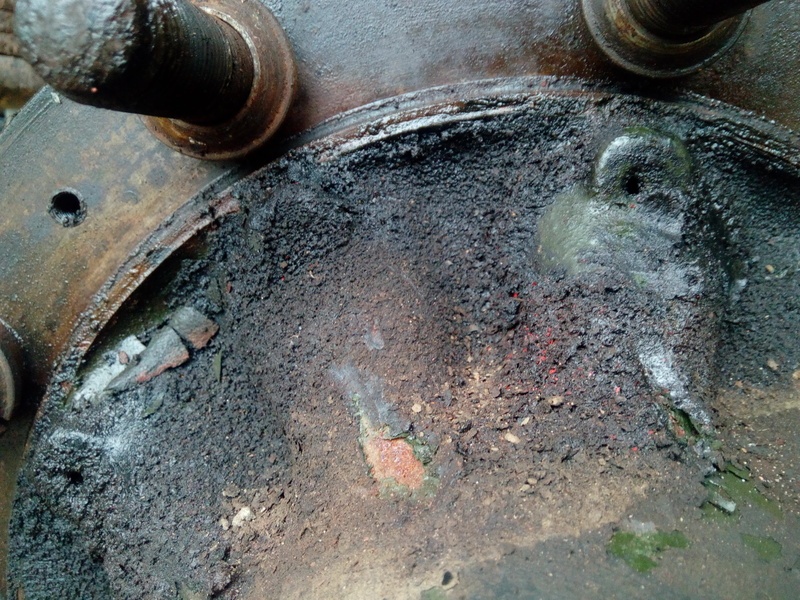 This is where I am expecting problems; mostly corrosion of the cylinder bore, etc. I do find it a little neat that you can still see the red rubber grease. Hi Tamber, keep going, you're doing a great job. The cylinders should be fairly easy to come by as they were fitted to many Bedford applications right through to the 1980s. 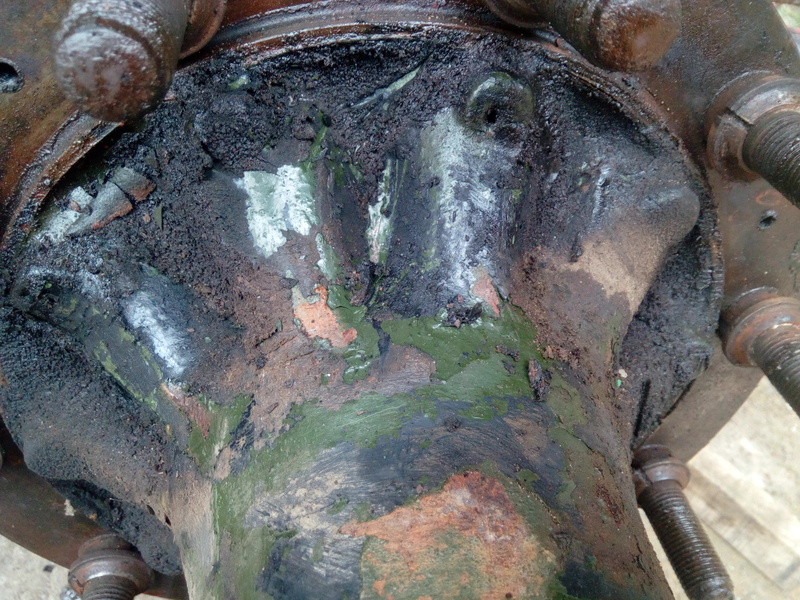 When re-greasing the bisectors don't use normal lithium chassis grease. 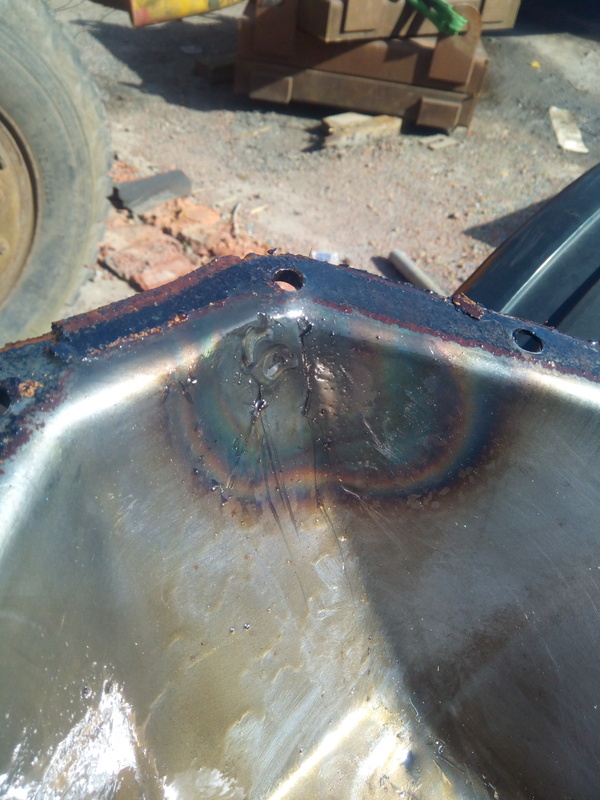 With some brands at least you can get a situation where with age, standing or high brake temperatures the oils drop out of the grease and contaminate the linings. The original specification is General Motors 4613-M but I don't have a cross reference for that. 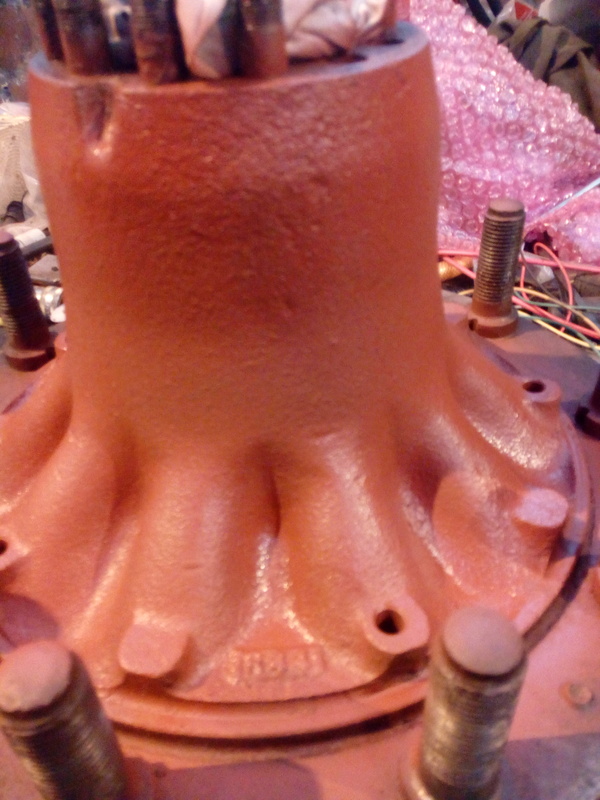 You could probably find a grease specifically designed for moving parts of brake assemblies. I'll keep muddling along, then! Crusty old grease! This, and a light coating of surface rust in the bores, made it surprisingly difficult to get things to budge at first; a liberal hosing down with our favourite close-to-hand "maintenance spray" and a bit of firm tapping and pushing got the various bits to slip free, whereupon the good ol' fingerprint-remover was put to use. 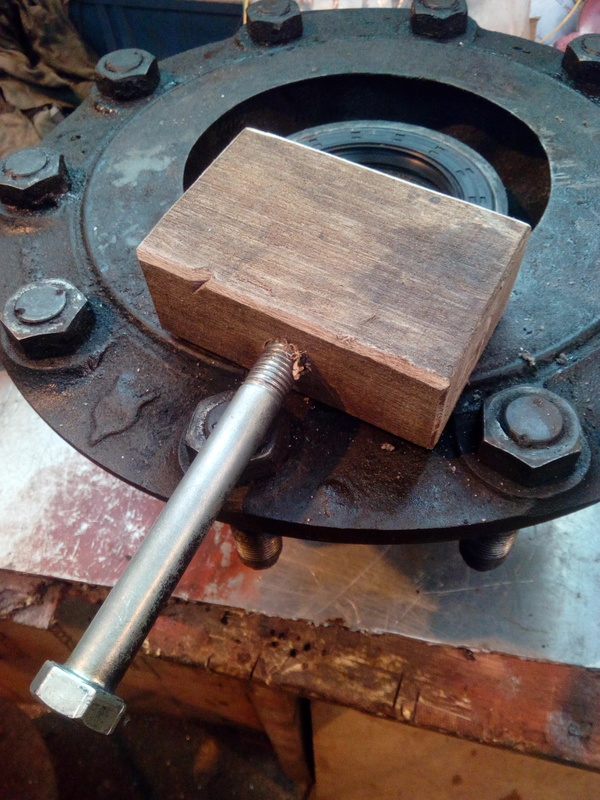 I also gently applied a strip of fine emery cloth on a spindle in the drill to the inner bores just to clear off the surface rust; and give everything a quick spritz with light oil to stop it corroding in the workshop. Went back together quite nicely, and all moves nice and freely; should only need greasing, and a new gasket for the cover-plate. A brief search on Ebay while I was writing this seems to have turned up some NOS units that appear to be just the thing. Lockheed L4255-099. Careful - there are two types. Both are 1 9/16" bore but you need to measure the brake pull rod diameter. 4255-099 fitted 1952 - 1961 has 5/16" pull rod while the later 1961 - 1969 fitment with 3/8" pull rod is 4255-103. 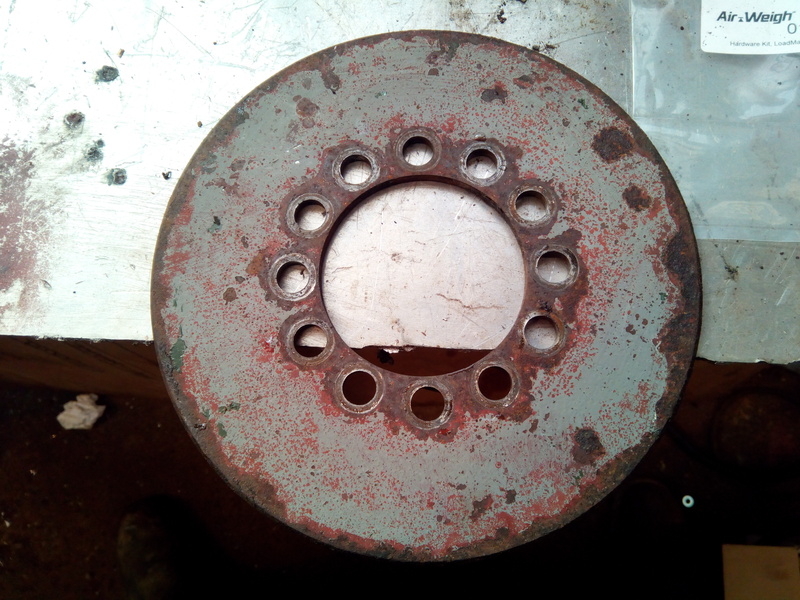 This gumming is typical of those bisectors; often you find the only thing stopping them working perfectly is the dried grease. I've even had them with zero braking effort on one side due solely to the bisector being gummed up. We shall see whether or not it's the right size when they turn up (...from Germany, no less! ), but from -- my admittedly patchy -- memory the pull rod seemed closer to 5/16" than 3/8". If not, then I can trade around to get the right combination of bits. EDIT: Measured the pull rod when I got into work today. 5/16". Phew. EDIT END. Anything likely to catch me out with the repair kit? That seems reasonable enough; there's not a whole lot of parts in there, and it seems to be a pretty robust mechanism. I'm surprised at how fresh the rubber seems. A far cry from the rusty, grunge-encrusted old one I took off! Refitted the hub the other da... last week, apparently. How time flies! :wow: The new seal seems to fit a treat, anyway. I also checked that the brake cylinder screwed onto the bisector, which -- thankfully -- it did; and made myself that hub nut spanner I needed. 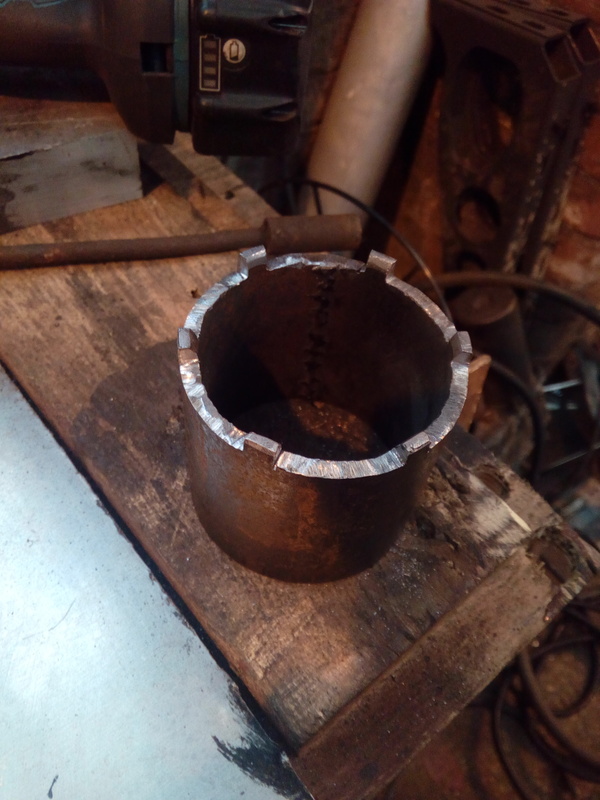 And then work consumed the time since then in a bit of a blur; and so I found myself finally getting around to using that hub nut spanner and tightening the nut in accordance with the WSM. Then, slung (Ahahahaha. Wrestled, wiggled, jiggled, twisted, squashed my finger.) the halfshaft back in, the ... plate... bit... back on, and tightened everything down. 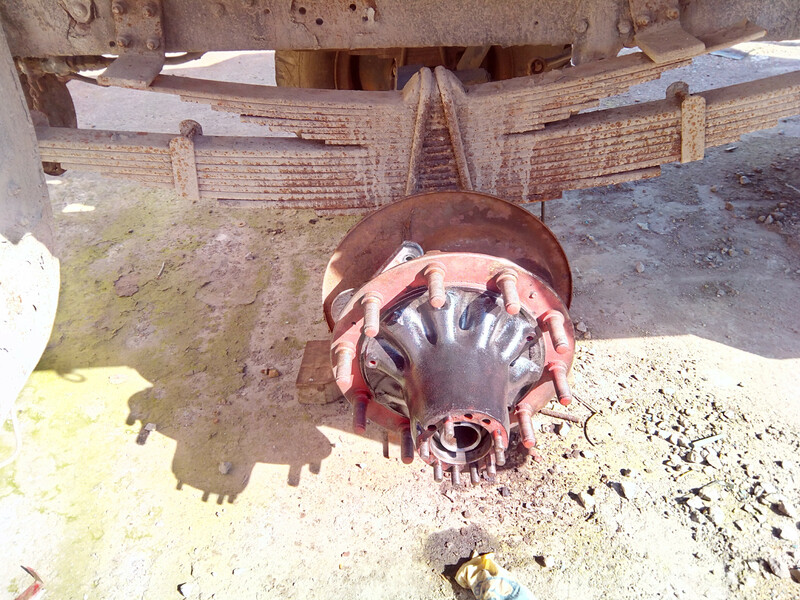 Then, full of enthusiasm, I went and tried the shovel method of putting the wheels back on; and I have to say, it works a treat! 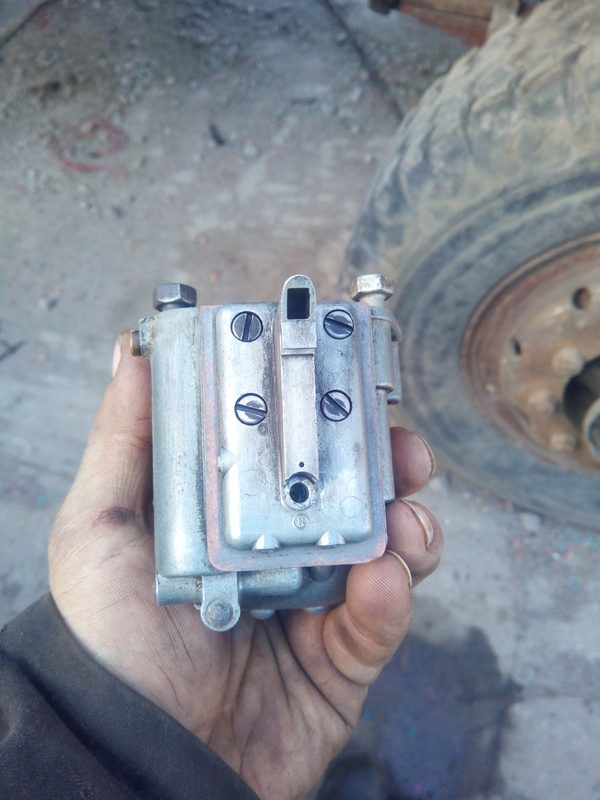 On the note of the brake hardware, it's been suggested to me to lubricate the expander with copper anti-seize paste, as it's often used on brake hardware elsewhere. Would there be any massive objection to doing so? I'm not sure I would; it's designed for a different job, typically in static situations; and in my experience in the places you're using anti-sieze in close proximity to friction materials (e.g. 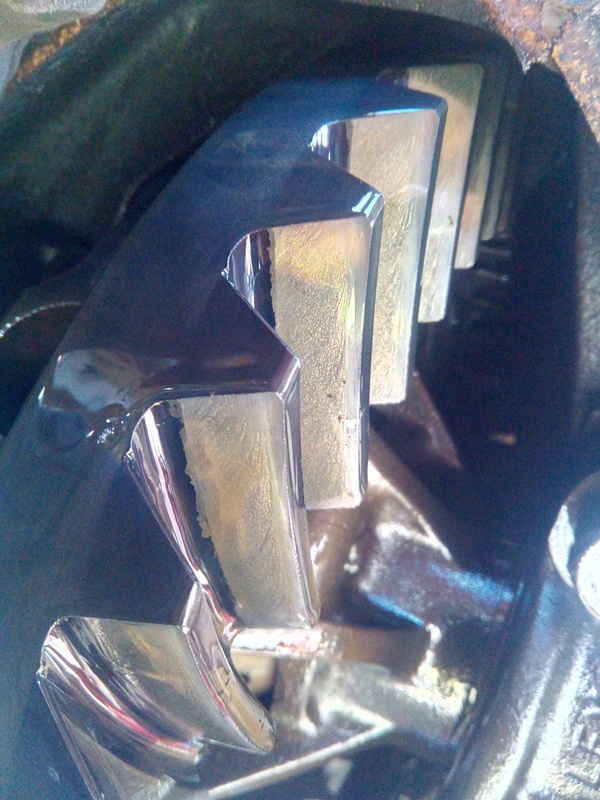 anti-rattle shims on brake pads) you're using a very thin smear so contamination risk is very low. Hmm. Fair enough. I'll keep looking, then. 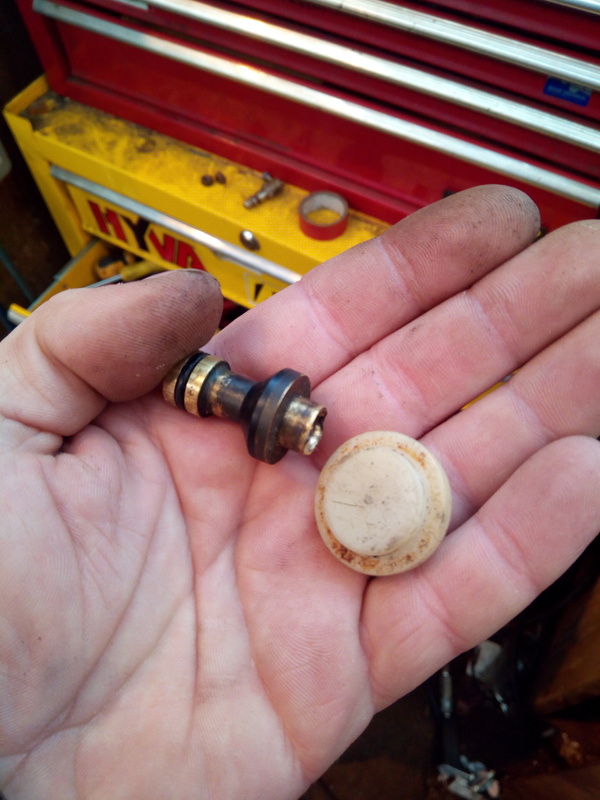 Tuesday before last, after work, I refitted the NSR hub; put the wheels back on, discovered I'd forgotten to put the tapered washers back on, threw my hands up in the air, and went home. Wednesday, I pulled the wheels back off, put the tapered washers on, put the wheels back on again; and moved over to attacking the other side. Now, the OSR is the one I made an attempt at attacking last year, and couldn't get the drum off. Still didn't get the drum off on Wednesday, either. 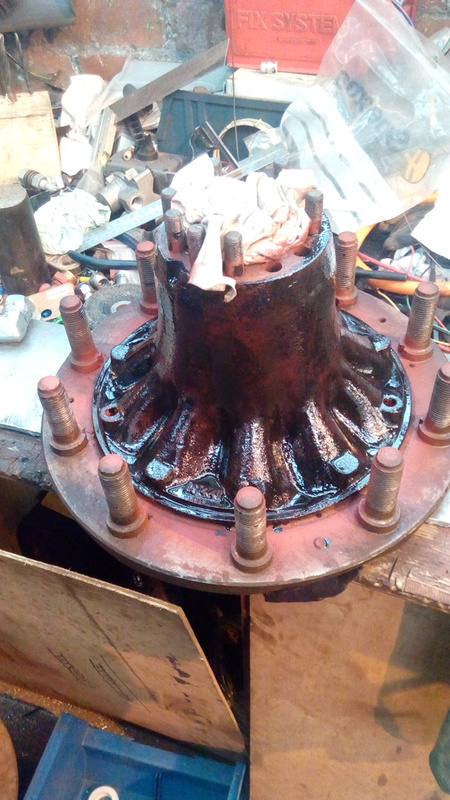 Took the whole hub off with the drum attached; which made it about as heavy and cumbersome to deal with as you might expect. For giggles, I took my camera with me and recorded most of the four-ish hours I was there; though, with the dead space and "sit here hammering on something for half an hour" clipped or sped-up, it's trimmed down to a little under an hour. Nearly a week after that (Which was a surprise to me, it felt like a mere couple of days! 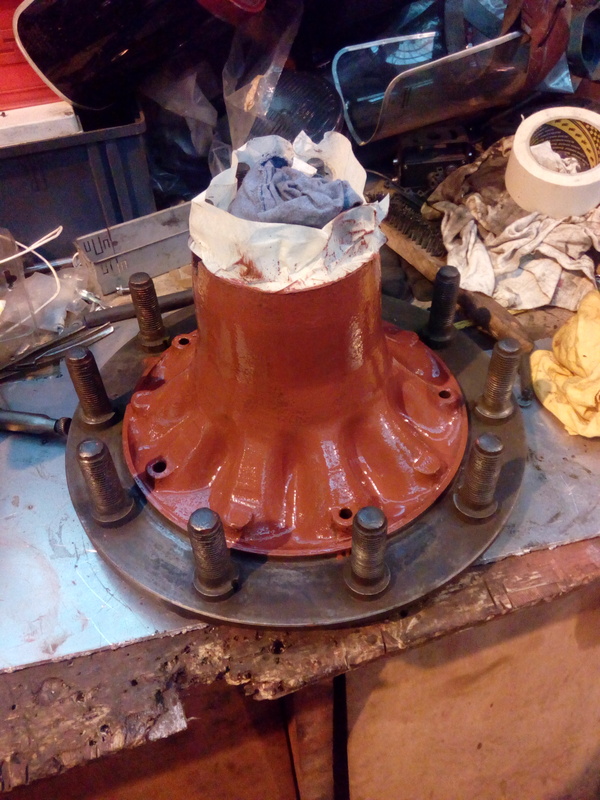 ), I got the drum separated from the hub; and oh boy did that take some effort. With the whole assembly sat on its back -- drum flat on the floor and the hub 'hanging' from the shoulders on the wheel studs -- I pounded on the end of the wheel studs with the 40oz "Persuader" until the thumping changed tone, and the hub dropped free not too long afterwards. I got complaints from everyone in the canteen on the other side of the building, because I'd filled their afternoon break with heavy thumping sounds. :rofl: I then celebrated by wiring up the other sidelight; because why not! 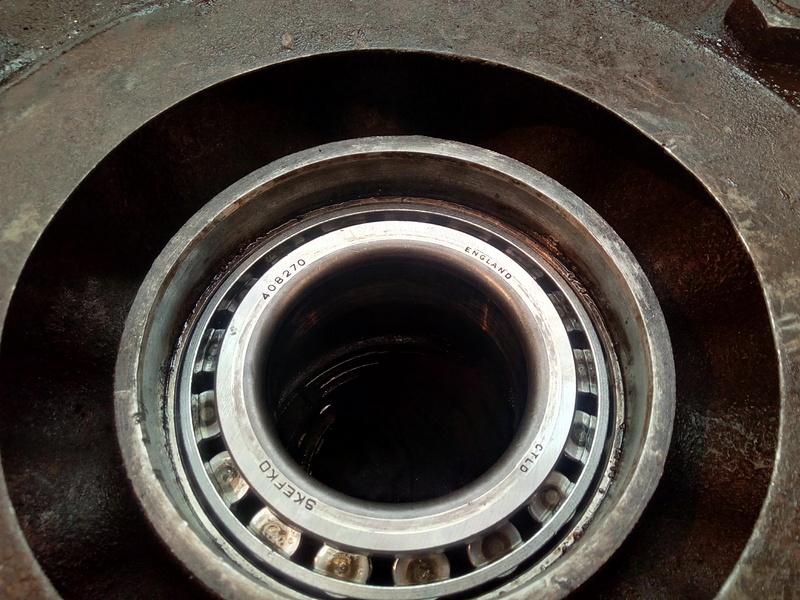 Out with the old seal, and admiring the bearing. 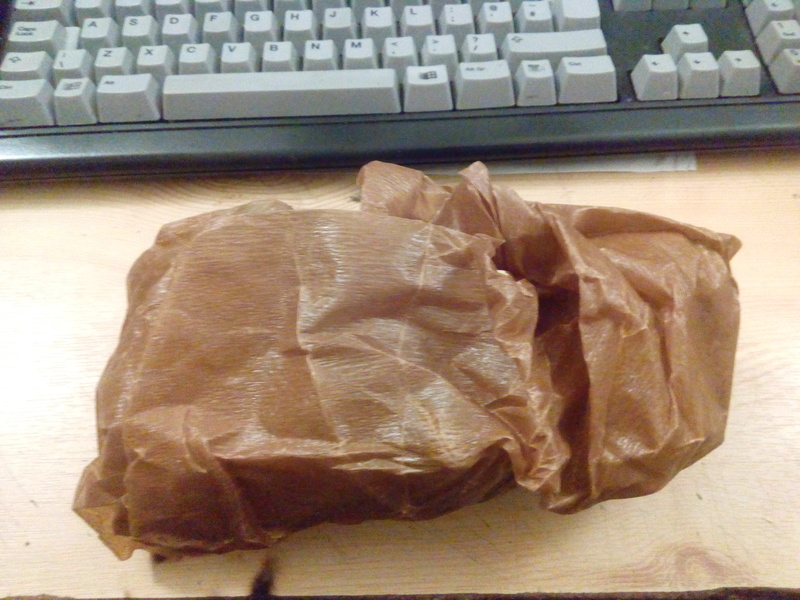 Then gently, but firmly, seat the new one; as seen behind my fancy new hand-made artisanal wooden mallet. 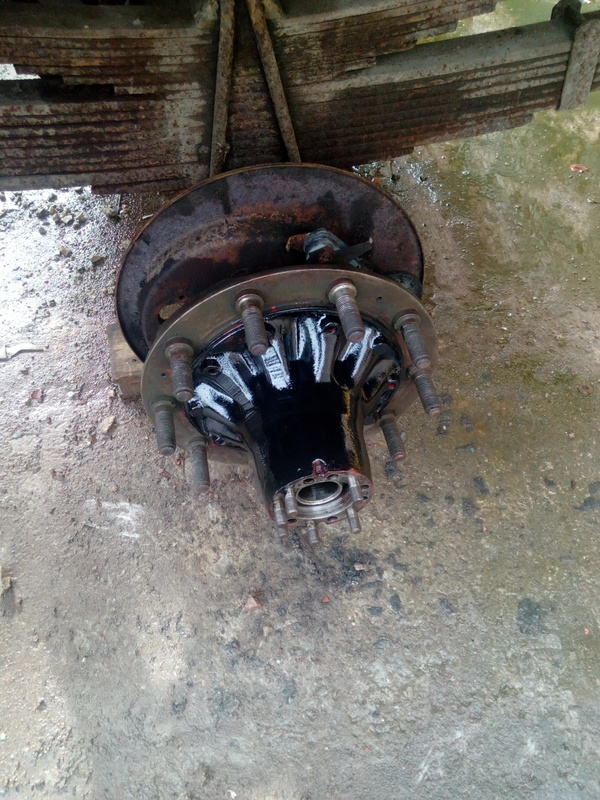 I've also now removed the brake shoes on the OSR, and am to attack the brake cylinder & expander next. Progress is a thing, it seems. Anyway! 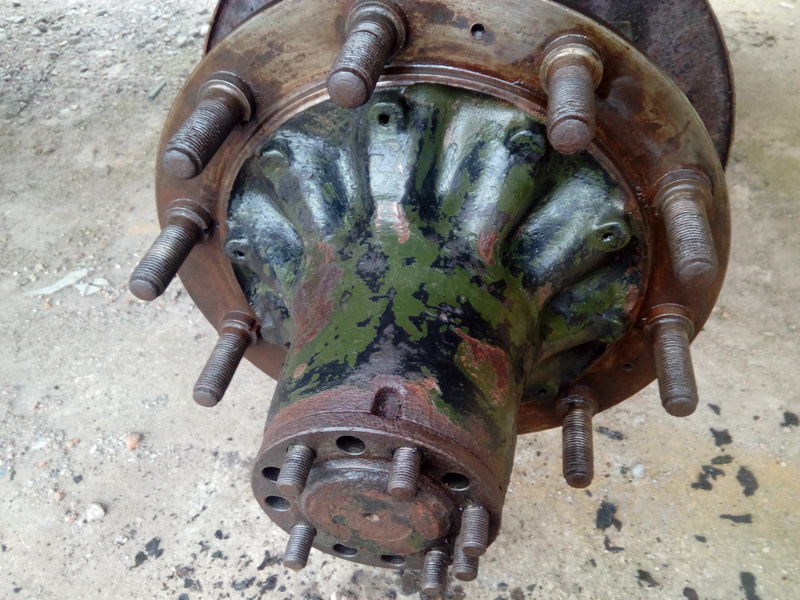 The OSR expander and brake cylinder are out, sitting on the workbench awaiting attention. 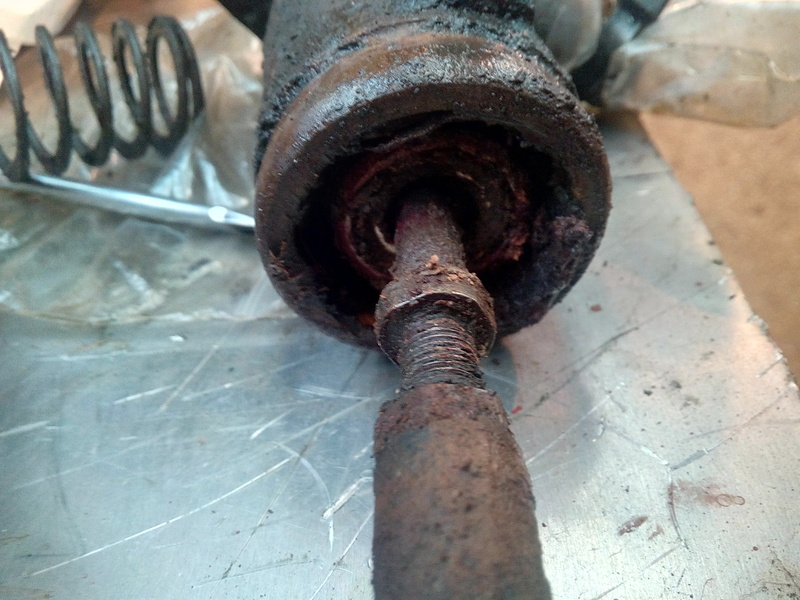 Gave myself a hard time removing them by forgetting to remove the stop-pin, so the brake cylinder didn't unscrew from the expander... the pull-rod unscrewed from the brake cylinder. Ah well. Sunday, I set in to be productive! Can't say I was really all that productive, and some pointless cosmetics happened. 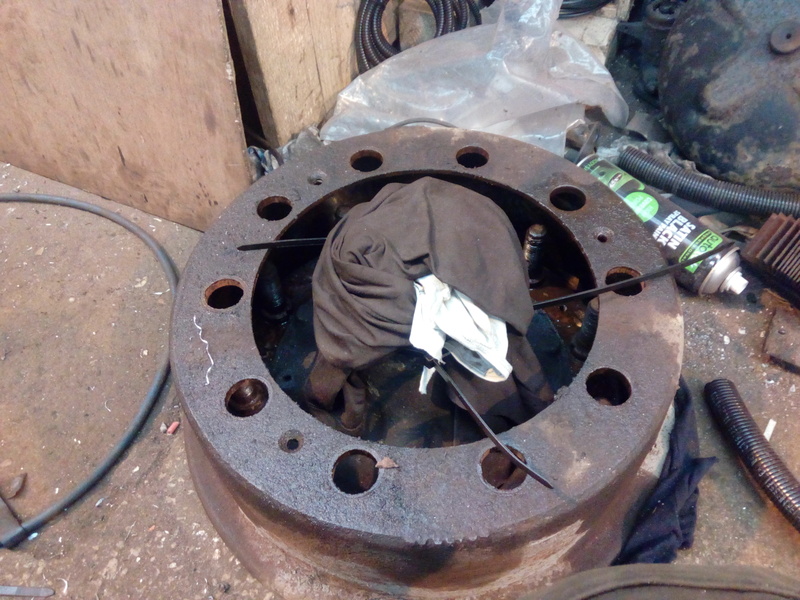 It all starts with the hub, which I slung on Saturday night; hub nuts in, torqued, etc. Well, it saves me wire-wheeling it to get the paint off, I guess. :shocked: No kidding, just the pressure washer with the heater turned on, and the paint just peeled off. So then I had to go get out the paint and make that all nice and shiny again. Looks like the cover has seen its fair share of chaos, though. 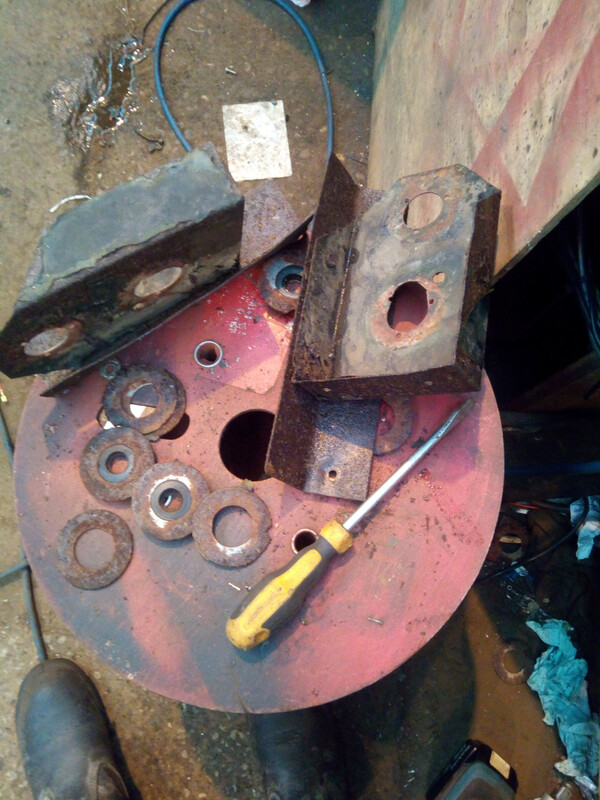 ...and I already had the paint out, so after a bit of faffing with a wire wheel to strip the surface rust... then running out of battery on the grinder, off to the pressure washer I went! Well, that's interesting. Once again, the paint just peeled back in layers; like an onion, but with less crying. Anyone recognise their handwriting, several decades later? :-D This was under a layer of black, then four or so layers of green. There's also a layer of white under there, too. Anyway, I cleaned it up, dried it off and gave it a couple of coats of paint; with a little twist. I think I'll give that little patch a coat of clear, because I found it interesting enough to keep. That was where I left it on Sunday, while I waited for the sealant to set. 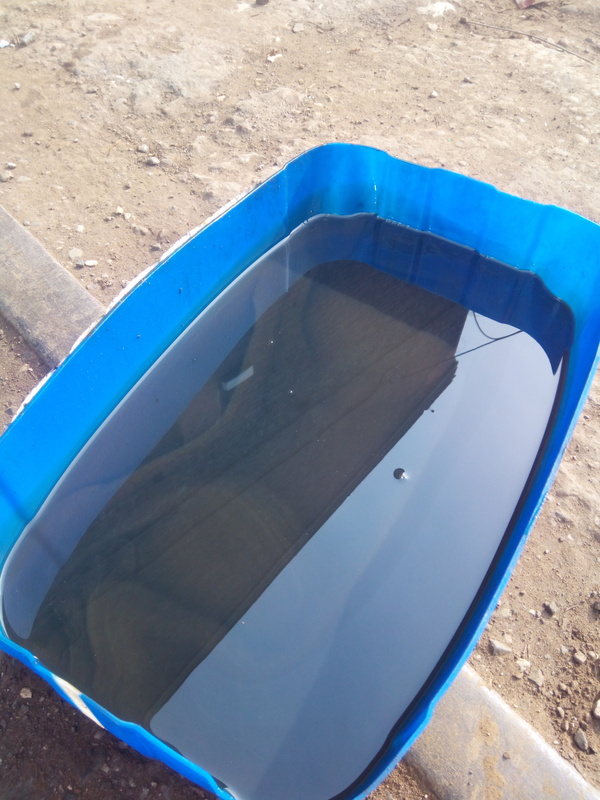 This afternoon, I got around to putting the oil in it; which was a slow, exhausting process... pumping 90-weight oil in until it started to ooze out of the level plug. Hopefully, I can now return my focus to the brakes; I'd like to have at least the rear brakes working by the end of the year. We'll see how that goes, but it's good to have goals, right? 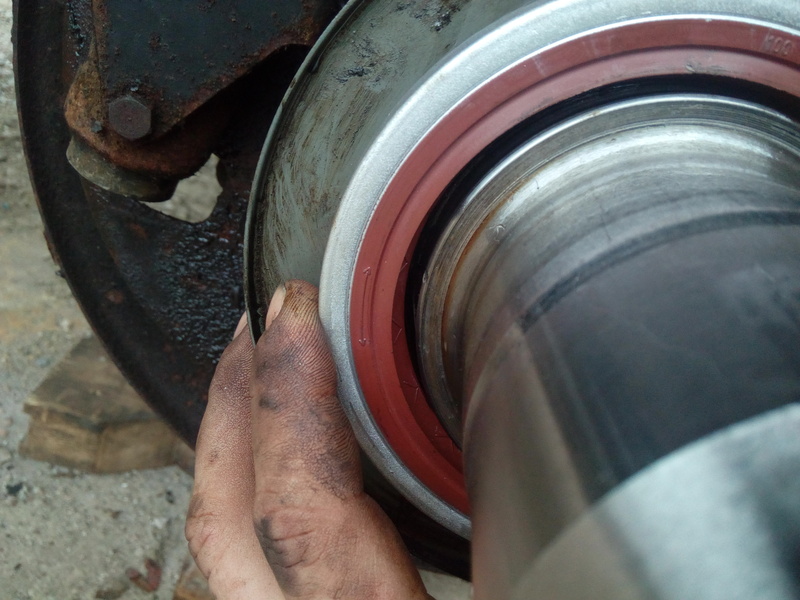 Tamber - I hope that's a turn of phrase and you haven't torqued the hub nuts - or it's not the bearing nuts you're referring to - or your bearings will die very quickly! Turn of phrase. :embarrassed: They're tightened to spec as per the manual: tight as possible by hand, with the socket sans bar, and then back off a sixth of a turn. Not sure if I'll need 'em, at the moment. I've not driven it with drive going through that rear diff, yet. We'll see. Nothing major at the moment; just trickling along getting bits and pieces together, so this is mostly a "still here, haven't given up" post. On the lights front... or, well, rear: I've gotten some light units for the back end. They're perhaps a touch too modern, but we'll see how they look when they're on the truck. More wiring to follow. I dropped the brake servo off at CTS a week or so ago to see if they could find the missing bits of the control valve for the servo cylinder; no luck there. Post what you need with photos, might have it or be able to find it. There is an old saying - "when an old man dies, it's as though a whole library has been burnt". I wish there was some way of downloading the knowledge of the Franks of this world. Forums like this are a start. Even just knowing what shape the missing bits need to be would be a great help! I agree with that sentiment wholeheartedly; tricky to get some of that information into a form that can be written down, though. 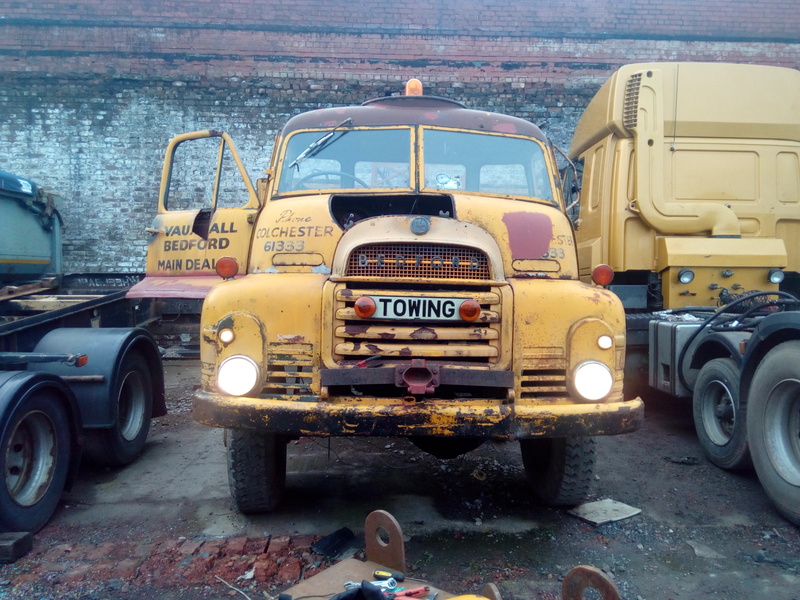 I decided not to work, today, due to it being a bank holiday; and, instead, ...went in to work, and spent the day getting rained on while I tinkered with the truck. 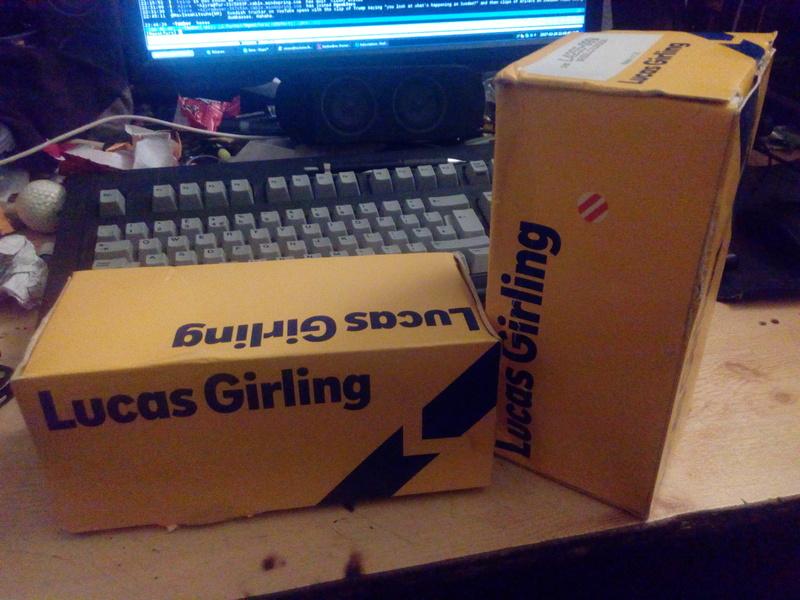 Looks like they were originally mountings for a pair of Lucas L594s. It did clean up nice, and everything moves as it should. Including the vacuum advance, which was looking rather sorry for itself initially. 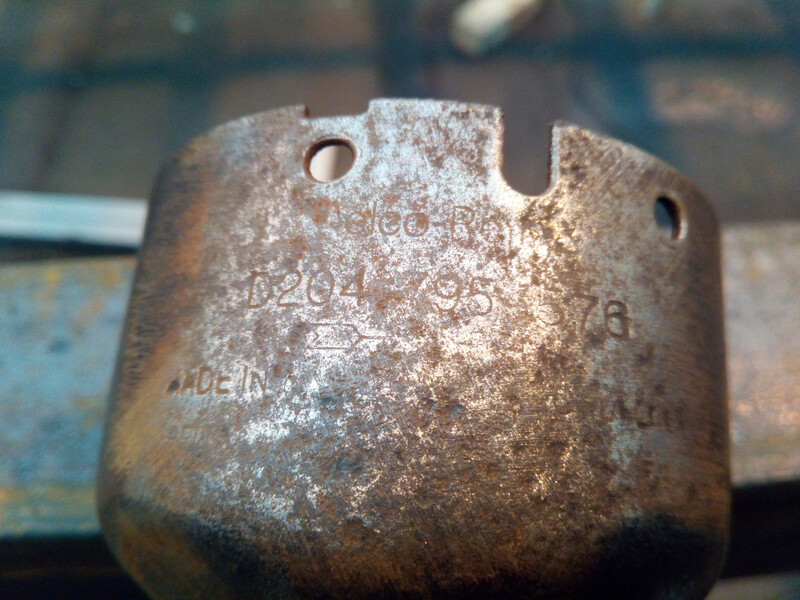 I did put a new O-ring on (size 211) while I had it out, and applied some copper anti-seize paste to where it sticks into the block, so that I'd have a chance of being able to adjust it. Some persuasion was required to get it to seat back in the block, but it went in with no major hang-ups, and can be twisted freely now -- with the clamp loosened off -- so I can actually adjust the timing. 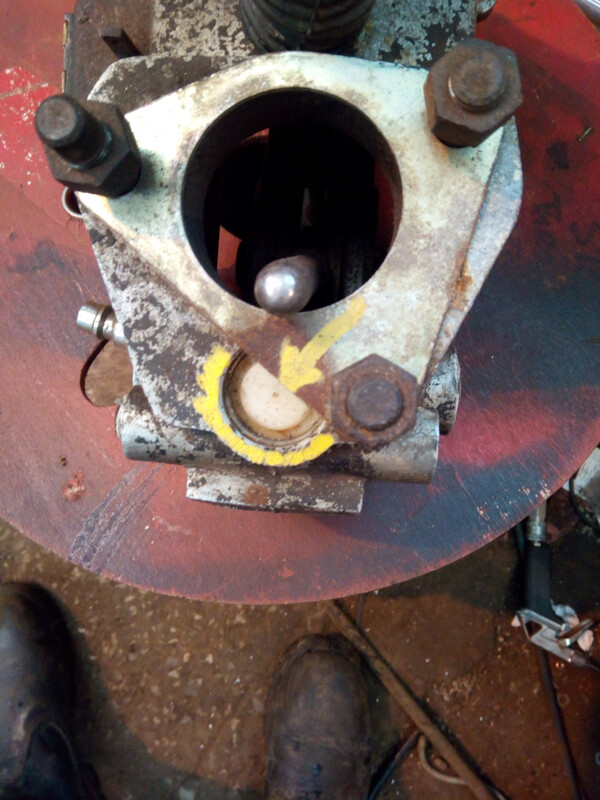 One tip you probably already know - the distributor clamp, if it's the one which is essentially just a folded piece of sheet steel, is easy to distort by overtightening the pinch bolt - it only needs to be pinched up fairly lightly. Lights look fine and can always be changed later. Look at all the AFS trucks running around with those big square Rubbolite units on. (Same with all those parts places that are wall to wall shelves with scruffy little cardboard boxes, and the old guy behind the counter who knows where everything is; even if you're looking for that 1958-only counter-clockwise turbo-retro-encabulator that's just a strange assembly with spinny bits and a collection of springs to everyone else. Then the Franks pass on, and you get left with the spotty young kid who's job is apparently just to tell you that the computer can't find the part you need because it doesn't recognise your chassis or registration number. 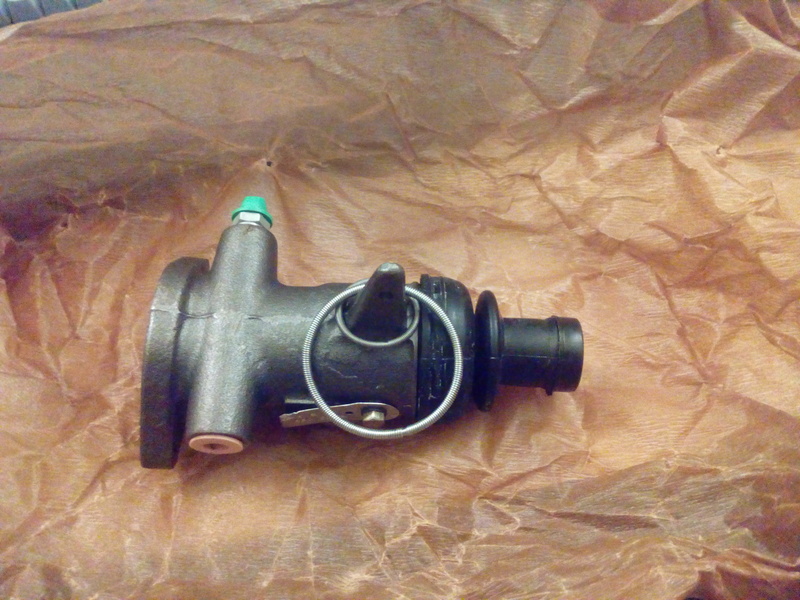 These are the bits I have: The plastic top cap, and part of the control valve. After prodding, poking, mapping the ports out, and headscratching, I have a rough idea of how it might've worked, and possibly what bits I'm missing (I think I have a drawing somewhere on my desk. I know I made a drawing, it's just finding it. 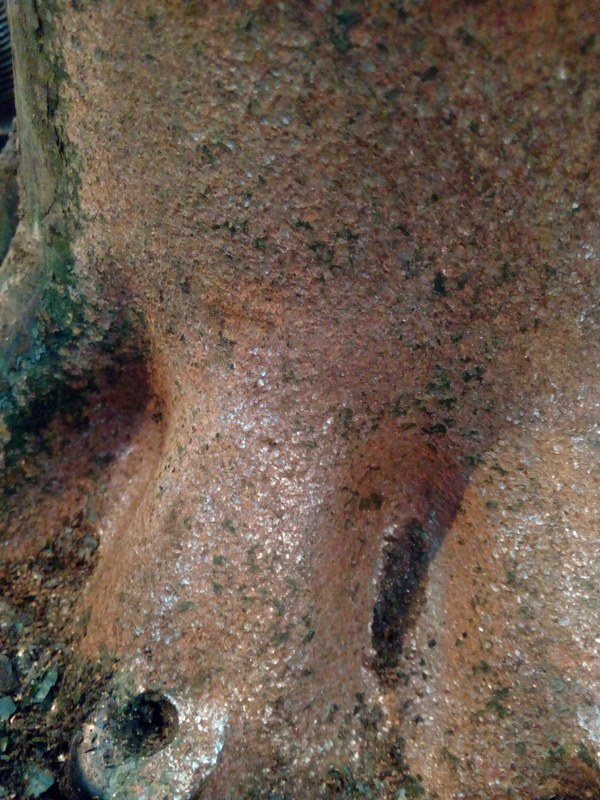 I organise geologically; think sedimentary.. :red: ); but that's not the same as knowing what was actually there and how it actually worked. 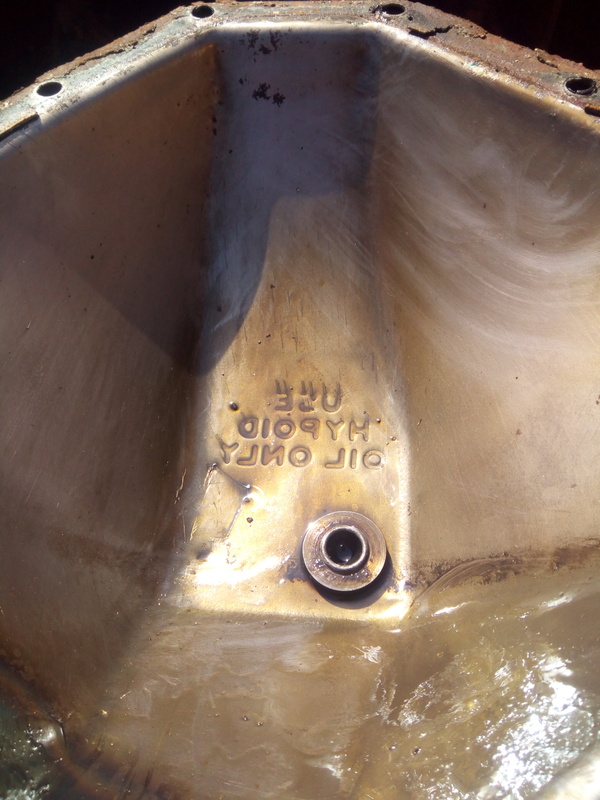 Thanks to Ian (Ian43 on this fine board), I now have a working door-lock and locking fuel filler cap. Eesh, if it's not one thing, it's another. The other day, I went to double-check and re-set static timing, just in case I'd screwed something up; and as I barred the engine over, there was a thunk and it stopped dead. Some checks were made, and I spotted fuel dribbling down onto the throttle-plate. 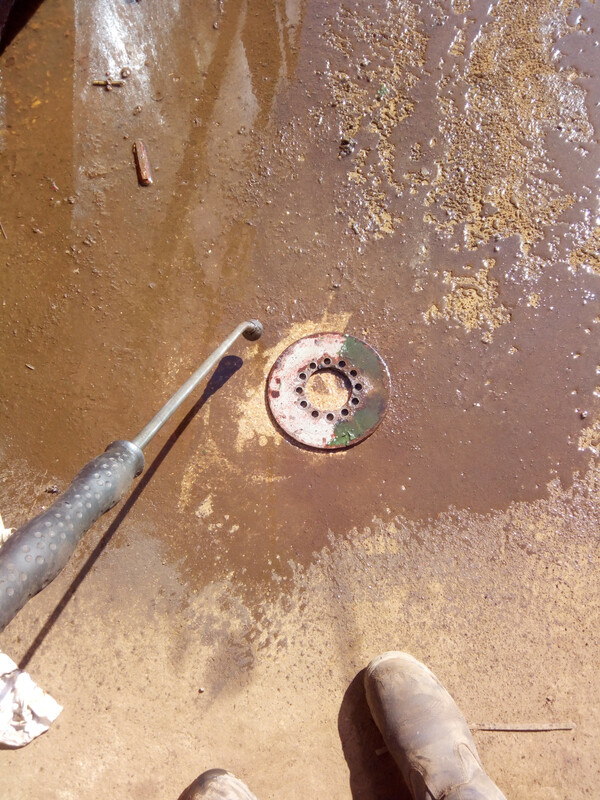 Did the usual wishful-thinking fix of tapping the float-bowl with a screwdriver; nothing improved. "Ah, fuel pressure's maybe a little high..." thinks Jim, in a full-on smoothbrain moment, completely forgetting that the electric pump was meant for carburettors and that sort of issue would've reared its head sooner anyway. So a pressure regulator was ordered, and fitted. And the problem persisted, even with the pressure set to 1psi. A co-worker suggested a stuck float, and the float-bowl was removed. Float wasn't sticking, but fuel did seem to be pouring out unless it was held at a certain angle.